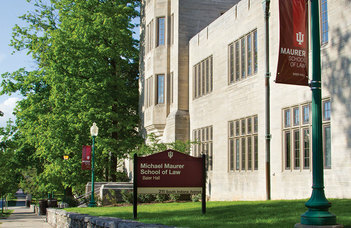 Dr. Réka Somssich, associate professor of the Faculty of Law, was invited to participate in a public conversation titled ’Lawmaking in Multilingual Legal Systems – How the European Union Legislates in 24 Languages’ to Maurer School of Law, Indiana University, Bloomington (US). The event, organized by the International Law Society and the International Programs Office of the university, was held on 29 October from 12.00 and provided an overview on the management of multilingual drafting of legal text within the EU’s institutional framework. The aim of the conversation was to show to the inquirers, what kind of measures and mechanisms have been brought into action in order to enhance the quality of the different language versions. The role and status of lesser used, small languages within the EU is an important topic planned to touch upon, being one of the fields of research of Dr Somssich. The way these languanges are influenced by English, which is the predominantly used language within the Union, is an exciting field for the researchers of law to investigate. During the conversation examples intended to illustrate the difficulties national legal languages have to face when translating and naming new concepts, which is a special characteristic of the EU law. Another agenda item aimed to explore the possible outcomes, that Brexit can cause to the dominant role of English language in the Union, after the withdrawal of the United Kingdom. Find more details about the research work of Dr. Réka Somssich on her Academia.edu profile.